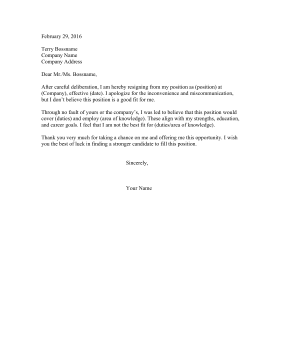 If a job isn't a good fit, use this printable resignation letter to leave the company. After careful deliberation, I am hereby resigning from my position as (position) at (Company), effective (date). I apologize for the inconvenience and miscommunication, but I don't believe this position is a good fit for me. Through no fault of yours or the company's, I was led to believe that this position would cover (duties) and employ (area of knowledge). These align with my strengths, education, and career goals. I feel that I am not the best fit for (duties/area of knowledge). Thank you very much for taking a chance on me and offering me this opportunity. I wish you the best of luck in finding a stronger candidate to fill this position.